3herosoft PDF to Image Converter is well designed effectual software for accurately converting multiple PDF documents to distinct image format files such as JPG, JPEG, PNG, BMP, PCX, TGA, etc., with ease, super fast speed and excellent quality. It is a standalone program and does not require Adobe Acrobat, or Acrobat Reader. The PDF to Image Converter is entirely efficient tool to focus on transformation of several PDF documents into image files and retains all graphics, drawings, diagrams, auto shapes, color, image, text, eclipse, lines and other symbols. And offers uniform conversion of number of PDF documents to image files or batches of PDF documents performs with outstanding results. 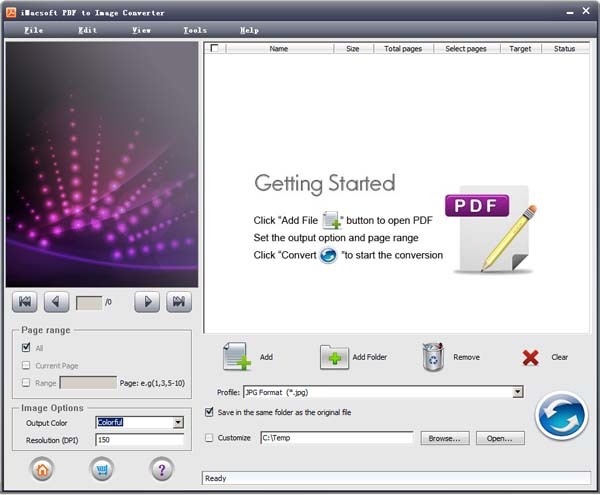 With this advanced and professionally PDF To Image Converter users can also convert PDF to JPG, JPEG, PNG, BMP, PCX, TGA in page range and set the output image DPI. And it is an ideal choice as a PDF to Image converter. At times you need to convert only selected pages of your document. In this scenario, you don’t need to convert the complete document. 3herosoft PDF to Image Converter allows partial document conversion. Specify the pages or page range for conversion and the tool will convert the document accordingly. 3herosoft PDF to Image Converter can convert PDFs generated through any application into Image. This makes this tool quite versatile. How to convert PDF to iMage files (JPEG, TIFF, BMP, GIF, PNG, EMF)?